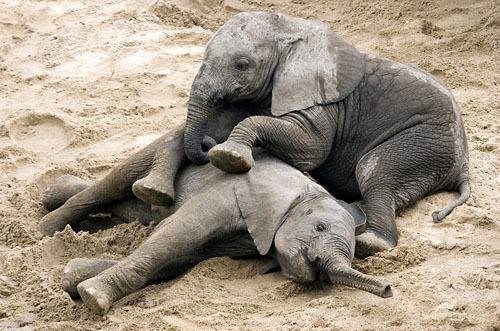 Elephants, in particular, demonstrate unusually high levels of grief in response to tragedy. They have also been shown to suffer psychological flashbacks resembling post-traumatic stress disorder (PTSD), and their wide range of human-like behaviors include mimicry, art, play, altruism, use of tools, problem-solving, cooperation, a sense of humor, and possibly language. Elephants, it turns out, have an unusually large and convoluted hippocampus, a region in the brain particularly involved in emotion. In elephants, the hippocampus comprises 0.7% of the central structure of the brain, compared to just 0.5% in humans and 0.1% in dolphins, another highly intelligent and emotional mammal. 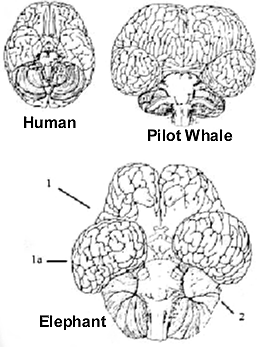 Memory is stored in the temporal lobe (structure 1a, left), which is especially large and distinct in the elephant. Their particularly developed spatial memory may account for their tendency toward flashbacks and incredible ability to traverse long distances by memory. All very fascinating, but in the meantime, makes a sad story for Tarra and her lost friend. It seems that Aristotle was correct in once noting that elephants are "the beast which passeth all others in wit and mind." Video courtesy CBS. Photos courtesy Wikipedia and Max Waugh.